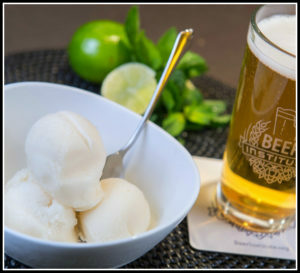 Image of Lager Lime Infused Mint Sorbet taken for the Beer Institute. Recipe was created by Chef Laurent Aubel. In a medium saucepan over medium heat, bring lager beer, lime juice, water, corn syrup, sugar and sorbet stabilizer to a simmer. Cover the saucepan and lower the heat, cooking for approximately 3 minutes. Remove the mixture from the heat, adding the whole mint leaves, and cool to room temperature. Chill the mixture for at least 4 hours. Freeze in an ice cream maker, according to the manufacturer’s instructions.